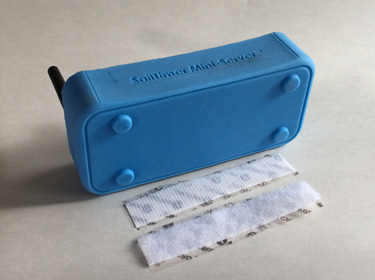 The first official photos and specifications for the SailTimer Mini-Server are now on the web site, along with the Owner's Manual. The original purpose of the Mini-Server was to connect the wireless SailTimer Wind Instrument to onboard electronics like a GPS chartplotter or wind gauge on a wired NMEA 0183 network. 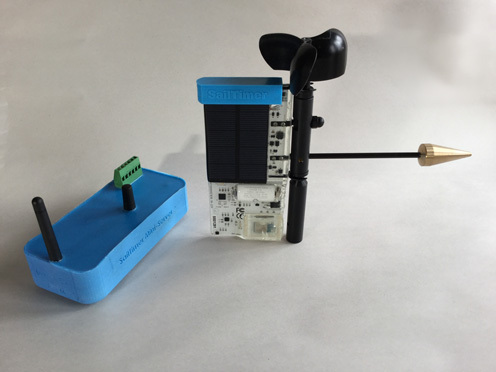 But if you already have a wired masthead anemometer, the Miniserver has a wiring terminal and can connect your wired network to mobile apps and the cloud. That's right: that old anemometer from 1998 that was on your boat when you bought it can now be used with the newest mobile apps and with crowd-sourcing of live wind maps! The Mini-Server opens up a lot of new capabilities. For example, whether you have a new wireless Wind Instrument or have had a wired anemometer for years, the Mini-Server lets you check wind conditions on your boat from home or work. That has never been possible before. Amazingly easy to use, as shown in this 1-minute YouTube demo. Just turn on the Mini-Server when you get to your boat. It will automatically connect to your mobile device or computer on wifi. It can also join your onboard wifi or marina wifi automatically. It also makes the Bluetooth 4/LE connection to Wind Instrument automatically. And then it can start sending wind data to your wired marine electronics. Works on any web browser too: The Mini-Server can transmit wind data from the wireless Wind Instrument or a wired network to any device with wifi and a web browser. Even e-readers typically have wifi and a web browser. E-readers are low-cost, have amazing battery life, and are easily viewable in direct sunlight. The Mini-Server can get GPS data from your onboard NMEA 0183 network or from mobile devices, for geolocation and functions like converting from Apparent to True wind. It can also retransmit all of your NMEA 0183 data on TCP wifi, connecting your wired network to the advanced features available in 3rd-party mobile apps. Simple design: just add 12-volt power to the wiring terminal, and it is ready to go. There are also NMEA 0183 input and output terminals if needed. The rubbery plastic case is durable and water-resistant. The only seams are on the wiring connectors, which could also be caulked-over. As shown below, velcro is a handy way to keep the Mini-Server in place. The footprint is only 2.75 x 6 inches (7 x 15 cm). Although it is shown below with 12-volt wiring at a nav station, you can also plug the Mini-Server into a wall plug in a boathouse or sailing club with an AC-adapter. Whether you have a wired anemometer or the wireless SailTimer Wind Instrument, you can send the data to our cloud database using the Mini-Server. This changes everything. 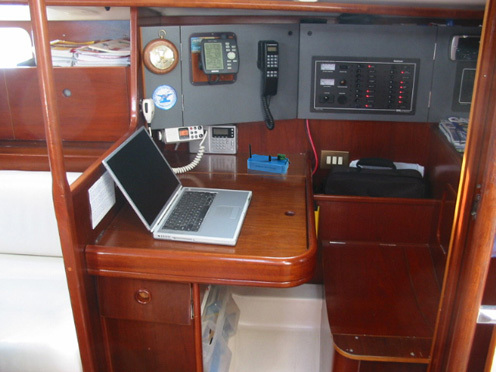 Even if you are offline you still have GPS on your boat, and the Mini-Server still works as a server with wifi. 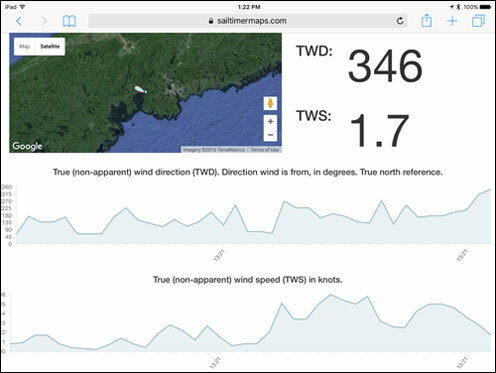 Plus our cloud database lets you (a) stream data to live wind maps or (b) store your GPS tracks and wind conditions offline until you get an internet connection again. When cruising, racing or just out sailing for the afternoon, you can then view and replay your GPS tracks and wind conditions. Sailing club members can watch regattas from shore in any web browser. Coaches can replay tacking strategies and wind conditions for performance analysis. You can go online from home/work to check live wind conditions from the Mini-Server on your boat. As in the screenshot below, you can also click on a wind barb or boat icon to see more detailed graphs and numerical displays of wind speed and wind direction. If you got a wired anemometer back in the days before smartphones, how else are you going to connect it to mobile apps and the cloud? No other product can do that. Suddenly your old anemometer takes on a whole new life. Our new technology often sells out and has a waiting list, but we have the SailTimer Mini-Server™ in stock now from the first production run. Shipping within a few weeks, with the new lower Customs fees explained below. Total price US $350 for the two parts: cloud server activation ($200) and Mini-Server hardware ($150).